In 1891, one star was added, representing Wyoming, bringing the total number of stars to 44. There were thirteen stripes representing the thirteen original colonies. This flag flew from 4 July, 1891, to 3 July, 1896. Peace Flag (1891) - As depicted in the postage stamp, it consists of 13 stripes, blue canton with 44 5-pointed stars in rows of 8-7-7-7-7-8, the whole surrounded by a white border. Using their First Amendment rights, Americans have enthusiastically pursued religious, social, and political goals and modified the flag to show commitment to country and cause. Dedication to world peace was once symbolized by this flag. Seen on the famous black and white photograph (original in the National Archives, Washington) by one of five of Peary's companions holding staff-mounted flags on an ice hill--blocks piled up by a pressure ridge--at the pole. The variant carries the text "Peace among all Nations." I was sent this image of a flag which was handed down from their grandparents. It is an usual pattern with the number 6 hand written near the grommet. 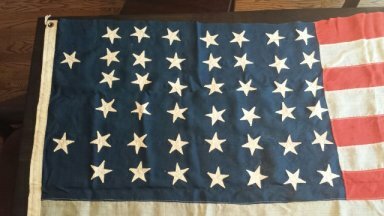 A different lay-out of stars was seen on a 90 inch x 144 inch flag posted on e-bay.